If you can dodge a wrench, then you can dodge a ball. People who throw spanners at him on the other hand, they’re fine. How about pitchforks, are those OK? The only mistake was, everyone thought it was hammer time. 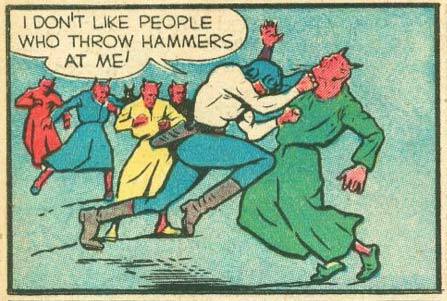 At first I thought this panel was kind of silly, but in retrospect I’ve come to realize I don’t like people who throw hammers at me either. I do, however, like cats. How about long walks on the beach at sunset while people throw hammers at you? Still no? Those devaronians should be wielding blasters in a casino somewhere, but no they decide to be pacifists and this is what they get. That made me laugh, I kept thinking of Diablo 2 how hammerdins(paladins using blessed hammer) were probably the most powerful thing in the game. No, one liked getting hammers thrown at them. Oh, and the hammers did extra damage against demons!! Lol. That is the least dynamic punch I have ever seen! I wonder why demons wear bathrobes anyway! Sutter_Kaine (7) speaking from experiance (as someone who has actually been hit in the head with a hammer) I agree whole heartedly. I do not like people who through or (swing for that matter) their hammers at me either. Those aren’t bathrobes; they’re clearly nightgowns. Look at the one in blue – you can see the lace trim around the collar. So he got them out of bed to tell them he doesn’t like people who throw hammers at him, EnderX? That’s so rude! Maybe it’s a recent discovery for him–like, perhaps he’s a try-anything-once kind of guy, and just got around to having hammers thrown at him for the first time today–and he’s super excited to share this revelation. But still, couldn’t it wait until morning?